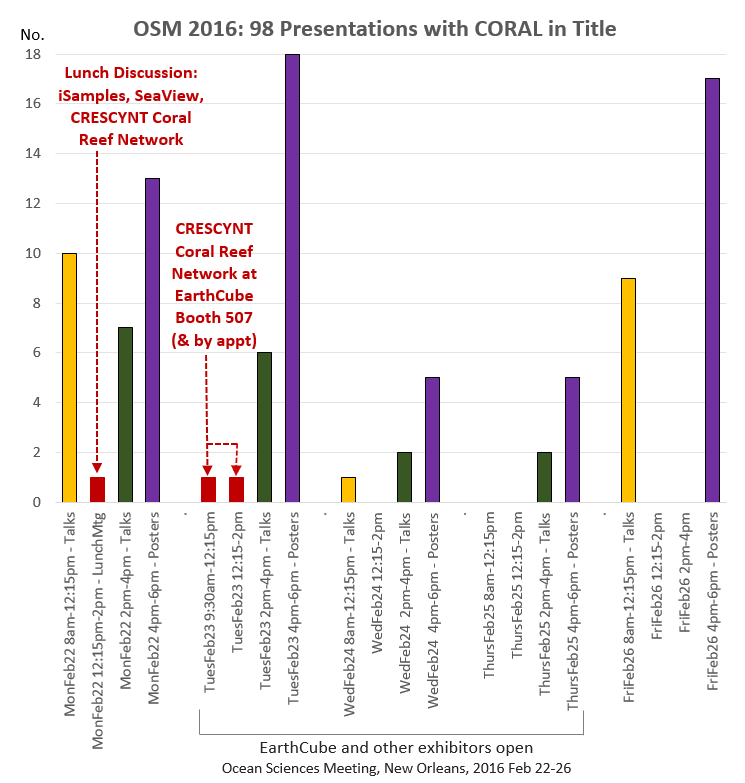 CRESCYNT at Ocean Sciences Meeting 2016 – and nearly 100 coral reef presentations! The 2016 Ocean Sciences Meeting is coming up in New Orleans 21-26 February 2016, and we hope to see you there! There are 97 oral and poster session presentations scheduled with CORAL in the title (plus a lunchtime presentation from CRESCYNT, making 98), and we hope to talk with coral reef researchers about YOUR needs and priorities for data, analysis, and cyberinfrastructure. 1 – Joint lunchtime discussion held with iSamples, CRESCYNT, and SeaView on Monday, Feb. 22, 12:30-2:00pm. Lunch will be provided! Register at http://bit.ly/1QFHLd1. 2 – CRESCYNT coral reef RCN will be at the EarthCube exhibitor booth 507 periodically, including Tuesday, Feb. 23, 9:30am – 2:00pm and on other days by appointment. Come by at that time or any time to fill out a CRESCYNT priority survey and learn more about EarthCube. 3 – Please email us at crescyntrcn@gmail.com to set something up. We’d love to talk with you while at OSM (or any other time). The chart below shows when the coral-related oral papers and poster sessions will take place. Hope to see you there!